Disease control of RRMM remains poor. The SLAMF7-directed, immunostimulatory monoclonal antibody elotuzumab (elo) plus lenalidomide (len)/dexamethasone (dex) showed sustained progression-free survival (PFS) benefits and acceptable safety in patients (pts) with RRMM in the phase 3 ELOQUENT-2 study. The immunomodulatory drug pomalidomide (pom) plus dex (Pd) is indicated for pts previously treated with len and a proteasome inhibitor (PI). In addition, as elo and pom may have synergistic effects similar to elo and len, we hypothesized that elo plus Pd (EPd) would be well tolerated and effective in pts who had failed prior len. Initial data from a single-arm phase 2 study suggest EPd is well tolerated. To compare the efficacy and safety of EPd vs Pd in pts with RRMM in the phase 2 ELOQUENT-3 study (NCT02654132). Pts with ≥2 prior lines of therapy (LoTs), including len and a PI (pom not permitted), who were refractory to last therapy and either refractory or relapsed and refractory to len and a PI were randomized 1:1 to EPd or Pd and treated in 28-d cycles until disease progression/unacceptable toxicity. All pts gave written informed consent. Elo: 10 mg/kg IV weekly in cycles 1–2 and 20 mg/kg IV every 4 wk thereafter. Pom: 4 mg orally on D 1–21 of each cycle. Dex: 40 or 20 mg equivalent weekly for pts ≤75 y or >75 y, respectively. Primary endpoint: investigator-assessed PFS (final analysis presented). Secondary endpoints: overall response rate (ORR) and overall survival (OS). Of 117 pts, 60 were randomized to EPd and 57 to Pd. Median age was 67 y; median (range) number of prior LoTs was 3 (2–8). Prior therapies included bortezomib (100%), len (99%), carfilzomib (21%), ixazomib (6%), daratumumab (3%), and stem cell transplantion (55%). 87% of pts were refractory to len, 80% to a PI, and 70% to both. At database lock (Feb 21, 2018; minimum follow-up 9.1 mo), 40% (24/60) and 20% (11/55) of treated pts remained on EPd and Pd. Disease progression (EPd 43% vs Pd 56%) was the main reason for discontinuation. EPd showed a 46% reduction in risk of progression or death vs Pd (hazard ratio [HR] 0.54; 95% CI 0.34–0.86; p=0.0078; Figure). 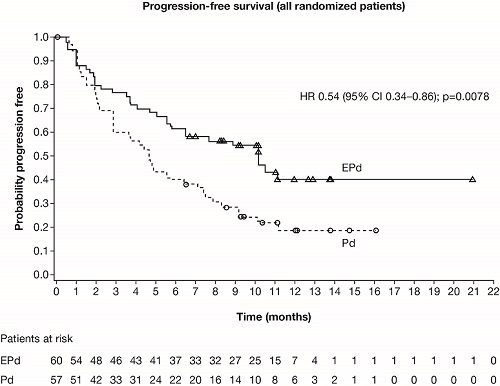 Median PFS (95% CI) was 10.3 mo (5.6–not estimable) with EPd, and 4.7 mo (2.8–7.2) with Pd. ORR (95% CI) was 53% (40–66) with EPd vs 26% (16–40) with Pd (odds ratio 3.25; 95% CI 1.49–7.11; p=0.0029). Very good partial response or better was seen in 20% (EPd) vs 9% (Pd) of pts. Immature OS suggested a trend in favor of EPd. Adverse events (AEs; not exposure adjusted) of grade 3–4 neutropenia (EPd 13% vs Pd 27%) and anemia (10% vs 20%) were lower with EPd, despite longer exposure (median number of cycles 9 vs 5) and similar dose intensity of pom between arms. Any-grade infections occurred in 65% of pts in both arms. Infusion reactions occurred in 3 (5%) pts with elo; all were grade 1–2 and manageable. AEs led to discontinuation in 18% (EPd) vs 24% (Pd) of pts. Deaths (EPd 13 vs Pd 18) were mostly due to disease progression (13% vs 25% of treated pts). In this first randomized trial of elo plus Pd for RRMM, EPd showed a clinically meaningful and highly significant 46% reduction in risk of progression or death vs Pd. More pts remained on EPd vs Pd at cutoff date, and safety was consistent with prior reports of elo and pom. These data suggest that EPd may be a new treatment option for pts with RRMM who have failed len and a PI.